I love these soupy noodle dishes. They’re so quick to make once you’ve done the chopping and really tasty. I shared a recipe for Thai-inspired Red Curry Noodles a couple of weeks ago. 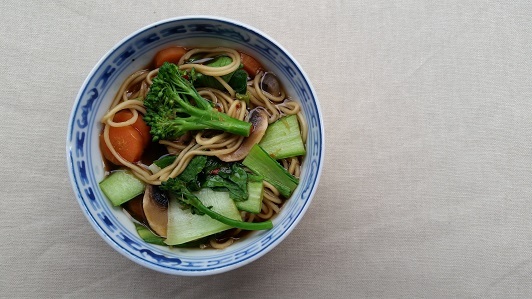 Today’s noodle hot pot recipe, inspired by one in the Wagamama book, “Ways With Noodles” by Hugo Arnold, is a similar combination of elements (basically a seasoned stock, vegetables and noodles) but with lighter flavours. It’s one of those things that feels nourishing as you eat it, quite restorative. I’ve given quantities to make this dish for one but you can easily multiply it up for however many people you are cooking for. 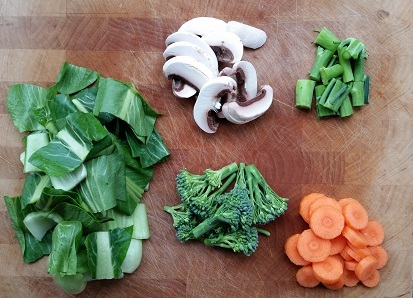 I’ve used pak choi, carrot, broccoli and mushrooms this time but you can choose any selection of vegetables. Slice them finely so that they will cook quickly. I always separate the stems and florets of the tenderstem broccoli and only add the florets at the last minute so that they don’t go soggy. Finely sliced red pepper, bamboo shoots, mange tout, sliced courgette and fine green beans also work well in this. Put the vegetable stock, rice wine, soy suace, sugar, garlic, ginger and chilli in a large saucepan and bring to the boil. Add the finely sliced carrot and broccoli stems and cook for 3 minutes. In the meantime cook the noodles as directed on the packet and drain when they are cooked. Add the mushrooms to the stock and cook for a further minute. 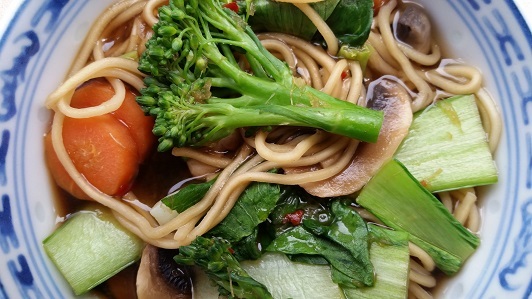 Add the pak choi, broccoli florets and noodles, cook for another minute and then stir well and serve.